An all-American celebration deserves a setting unlike any other. 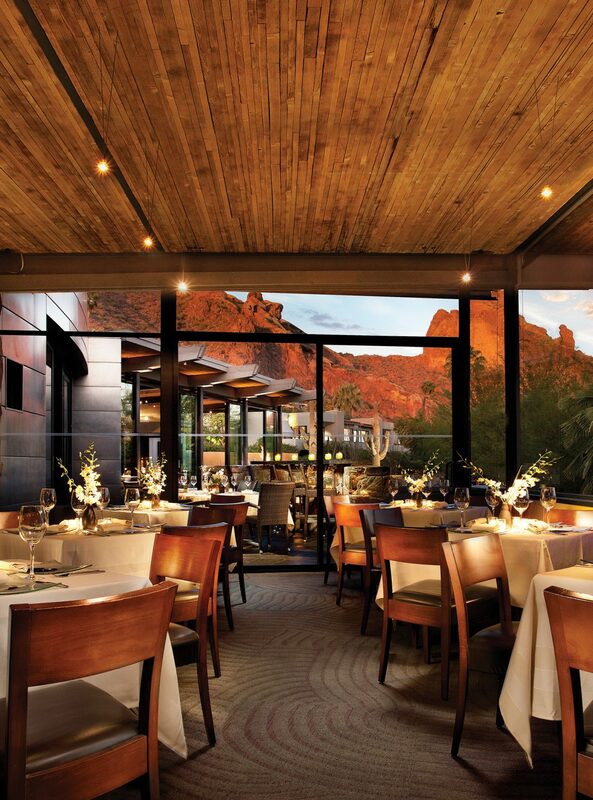 Discover why Scottsdale’s extraordinary 53-acre hideaway on the north slope of Camelback Mountain was ranked by Travel + Leisure in 2014 as the Southwest’s best resort. Make it an extra festive weekend and relax in a luxurious casita or suite, lazing on the scenic patio overlooking the breathtaking vistas. Or spread out with family and friends in one of six private homes, each with two to five bedrooms and an enticing selection of distinctive features. Food Network star Chef Beau MacMillan creates a four-course, prix fixe dinner at the award-winning restaurant. Begin with features like roasted butternut squash soup, pumpkin gnocchi, caramelized fennel tart, dock confit & sweet potato hash, foie gras mousse terrine, or carpaccio of local beets. Choose from three salads that include endive & watercress, bloomsdale spinach, or butterleaf lettuce. Select from delicious entrees including pan-roasted filet of beef, smoked tenderloin of pork, traditional turkey, roasted halibut, crispy arctic char, or toasted quinoa & eggplant fritter. Conclude with decadent desserts like pecan butter tart, white chocolate pumpkin bread pudding, or warm apple hand pie. For a full description of each choice, view the menu at SanctuaryAZ.com/food/events/holidays.html. Reservations are required for this special event with seatings from 12-9pm on Thursday, Nov. 27, for $75 per person plus tax & gratuity ($25 for ages 6-12, free for 5 & under). Call 844.284.2686. Spectacular vistas enhance this gala holiday buffet featuring a chef’s charcuterie board with traditional condiments plus a variety of traditional classics and new twists on old favorites. Choose timeless dishes like roasted turkey & gravy, chestnut stuffing, cranberry apple relish and garlicky green beans with fried shallots, or mix it up with delicious alternatives like roasted loin of pork, celery root & wild rice salad, and sweet potato casserole with vanilla strudel topping. Assorted Thanksgiving desserts complete the buffet, served from 11am-4pm on Thursday, Nov. 27. To view the full menu, visit SanctuaryAZ.com/food/events/holidays/html. Reservations are required ($55 per person plus tax & gratuity, $20 for ages 6-12, free for 5 & under), so call 844.284.2686 to choose your time. For getaway and spa reservations at Sanctuary Camelback Mountain, 5700 E. McDonald Drive in Scottsdale, call 844.284.2686 or click SanctuaryAZ.com.